Welcome back everyone! It was an action packed segment of chapters for us this week, yes? We read chapters 13-16, and quite a bit happened. Let's dive right in! 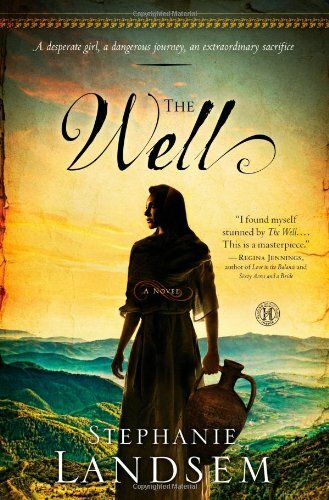 We had left off with Nava encountering Jesus at the well and returning to Mara a changed woman. As we pick up the story from there, we can see there there has indeed been an encompassing change in Nava. Not only is she passionate about Jesus being the One they have been waiting for, her life is now seemingly devoid of mental illness - she's up and about, taking care of Asher and their home. The fact that Jesus interacted with her at the well is shocking to her and everyone else in their village. There is a lot of time here spent on how Samaritans were seen by other people at that time that I did not fully realize. I did a little research on my own to understand how their faith was different from other Jews, as I was confused by this distinction. I love learning new things! Nava actually gains some acceptance from a few kind-hearted villagers who are curious about Jesus and take him and his followers in for the night (Shem's grandmother and grandfather). There is, of course, still considerable backlash against Nava, and now new mistrust of Jesus and his sympathy with Nava. We spend some time getting to know Jesus and his apostles, and about the different reactions to them and their teachings. A lot of trepidation in the town, to be sure. Creepy Alexandros returns and is abusive when Nava refuses him for the first time (big surprise there 😡). As well, Nava tries to spare Mara the knowledge that Zevulun has instigated a trial against her for adultery. When we leave off, the trial is just about to start, and Mara has been sent off on an errand so that she will not be aware of what is going on. So! I really enjoyed the increasing action of the narrative. It's so refreshing to see Nava interacting with her children in this new way, and to see her clearly so rejuvenated physically, emotionally and spiritually. This all makes things infinitely easier for Mara, another perk, though I know that their danger has increased in other ways - Alexandros and Zevulun falling at the top of that list. Shem continues to grow into his role in his grandfather's olive grove, and it's lovely to see how he's noticing nuances amongst these new friends and family in his life. This includes Mara, of course, and we're all still waiting to see how these two can end up together. As chapter 16 closed, my heart is hurting for Nava. Really looking forward to picking this up again over the weekend! Next week we will discuss chapters 17-20. What did you all think of this week's chapters?! Reading these chapters kept me on the edge of my seat! Nava's transformation (and the uplifting effect it has had on her children) has been amazing to behold, though this week's reading does end on a rather precarious note for her. Enjoyed the scene of the apostles puzzling out Jesus's words and actions. I find it a very powerful idea that they weren't quite sure who exactly Jesus was and what his endgame would be, but nevertheless felt called to follow him -- and die for him if necessary. My favorite quote from these chapters comes from the discussion of whether Jesus is the real deal or not. "If he is a fraud, he is not a clever one, because he is not giving anyone what they want." This is mentioned in the context of his dissimilarity to what people expected from the foretold Taheb and/or Messiah, but really struck a chord with me as it relates to modern-day faith and prayer. What we want matters much less than what we need -- and that is Jesus. Kevin,*excellent* points! I thought the same thing about the interplay between Shem/his grandmother with the apostles when Jesus wasn't around. They do seem a bit uncertain about him still, which I wasn't expecting, but on the other hand makes perfect sense! I really learned a lot from these chapters in terms of history, culture and faith. I didn't want to put the book down after finishing this weeks chapter's. I really wanted to find out what happened at the trial. I was a little behind last week so I read about half of last's weeks chapters and all of this weeks chapters at once. I'm glad it worked out that way since they flowed nicely into each other. What struck me was the responses to Jesus that the villagers had. Zevulun is so hung up on what happened between him and Nava that he isn't open to what Jesus has to say. There is too much hate in his heart to be open to forgiveness. Shem struggles with Jesus's teachings because of his education. He struggles to reconcile what he has learned with what Jesus is teaching. I can identify with Shem's struggles and in him saw an example of why we need to become like children. Thanks for the link to the article on the Samaritans. It was interesting. I am so enthralled with this story -it's amazing. What struck me is the fact that the villagers didn't believe Nava was changed. Don't we see this often with people who turn around and change their lives - whether coming back to the faith or having a conversion experience? People doubt that they can 'really' be changed. It also struck me that so many people don't believe in miracles or the possibility that Jesus can heal. While we don't know what people really thought in those times - I love how the characters mirror the way people act today - they just don't want to admit - like Shem - that Jesus is the one - that He can do miracles. Donna, I love your take on this. I agree - such a large scale change is met with skepticism and general wariness. But it's so beautiful to behold such a lifegiving change in a person. I am *really* drawn into the story at this point, and I'm finding so many pearls of wisdom to apply in my own life! I'm so behind! And when I got caught up I kept forgetting to comment here. I was actually surprised that Jesus coming to town wasn't longer in the book and a bigger deal. It was almost like it was this side story that was NBD which I thought was weird but maybe we'll here more later on.